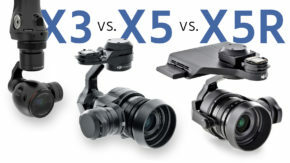 X5 vs. X5R Analyzed – Which DJI Zenmuse Should You Get? We’ve been busy testing DJI’s latest “toy”, the Zenmuse X5R RAW camera used on the DJI Osmo handheld gimbal and DJI Inspire 1 drone. 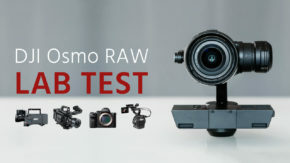 In our lab test, we found that the Zenmuse X5R can achieve amazing image quality. But with a pricetag of $3200 it is less attractive than its almost identical, half-priced twin: the Zenmuse X5. In this test, we look at the differences between the X5 vs. X5R. The main difference between the two cameras is easy to spot. The Zenmuse X5R records RAW dng sequences to very expensive DJI SSD media while the Zenmuse X5 records to a low bitrate h.264 format. Everything else is the same. The same micro 4/3 sensor, the same lens (if you get the lens kit version), the same gimbal. Here is where it gets interesting. In our X5R dynamic range test, we saw that the X5R can achieve about 12 stops of usable dynamic range. In comparison, the X5 gets only about 9 stops. Our software only measures noise and does not take the color changes in the last steps into account, which would more fairly rate the X5 at 7 usable stops in my personal opinion. Note that the X5 records 2 stops less in the highlights, so the test was done at F/2.8 on the X5R and F/5.6 on the X5. When we look at the recording from the test chart we can immediately see a striking difference in image quality. There is a lot of banding and the codec washes out a lot of parts of the image. The lower strips of the dynamic range chart in particular are displayed soft and without any detail. This means that the X5 will have a much, much harder time in high contrast scenes, such as when you’re filming a landscape on a sunny day or in scenes where the sun is your backlight. 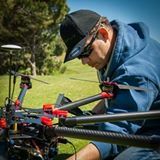 This is especially common in drone filming. The X5 seems to have a dynamic range more comparable to the old X3 camera that comes with the normal DJI Inspire 1. 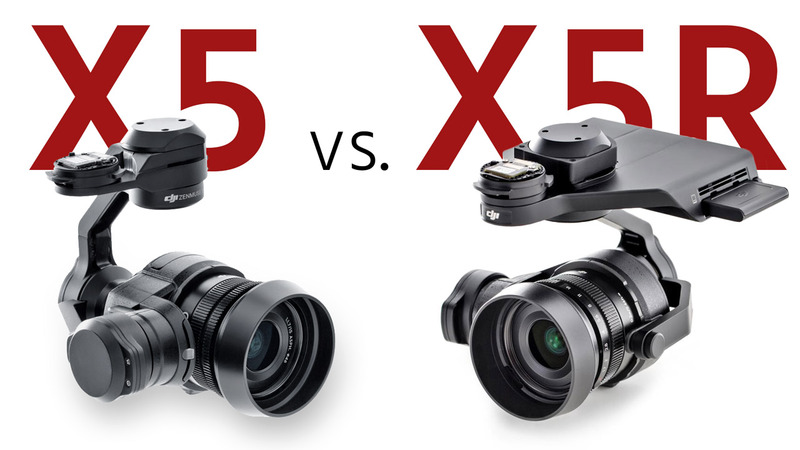 There is a vast difference in image quality between the Zenmuse X5 and the X5R. We applauded the image quality of the RAW version of the X5R when we compared it to professional cinema cameras on the market. The Zenmuse X5, however, performs really poorly. The image reminds me of the Zenmuse X3. Color gradations are extremely poor. Each of the thread spools I filmed is made up of a few shades of color and that’s it. Any other 8 bit camera is better than this. In practice, this means virtually no room for color grading. Of course, you can always apply a LUT, like you could on the X3. In terms of detail, in the highlight areas the camera performs well, though the X5R can retain the image quality better. The X5 image is also sharpened, which makes it look less natural. The X5 performs better here than the X3. When we look at the shadow areas, we see that we quickly lose detail. Here’s how the lack of dynamic range looks in practice: the codec and processing seems to be so bad, that any image detail is lost in the shadow areas. Sharpened edges and a weird magenta tint kick the image to its doom. On a fully charged Osmo battery, the Zenmuse X5 camera runs 59 minutes. The Zenmuse X5R on the other hand is very battery hungry and drains that same battery in 26 minutes (Test was conducted with continuous recording on both cameras). 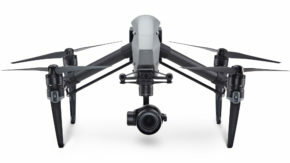 When used on a DJI Inspire, we also noticed that the battery life of the X5R makes your flying times much shorter. People have reported about the noisy sound of the Zenmuse X5R’s tiny fans. Indeed, when running with an Omso X5R as we did in our field test, the X5R can be quite problematic for audio. Surprisingly the Zenmuse X5 is only a little less loud as it also emits a fan sound that can ruin quiet recordings. In a very simple test we measured room ambience at 35db, the X5 at 55db and the X5R at 60db. Both at a distance of 10cm. Note that the X5R noise is higher pitched and thus more unpleasant to the ears. The Zenmuse X5 is very practical as it only uses Micro SD cards. A decent MicroSD card including a reader, costs $15. In comparison the X5R requires DJI SSD media that costs $1000 per 512GB card. Unfortunately RAW needs much faster write speeds and more storage. This will be a huge problem for many. But for professionals, used to a RAW workflow it is manageable. The Zenmuse X5R impressed us when we compared it to other cinema cameras and in our field test earlier this month, so we were really curious how the the Zenmuse X5 would hold up. At the end of the day the only difference between the two cameras is a different recording functionality. During this test we quickly realized that the Zenmuse X5R’s RAW capabilities make a huge difference when it comes to image quality and dynamic range. Apparently the X5 processing and compression is very basic and a lot of information seems to get “lost in translation”. Dynamic range suffers so much that it degrades the final output to only 7 honest usable stops in comparison to the X5R’s 12 stops. The Zenmuse X5 strengths are its very low weight, the interchangeable lens design, autofocus functionality and 4K resolution. Even though the detail and colour resolution of the X5R is better, the X5 can still deliver some nice images when used in a semi-professional way. 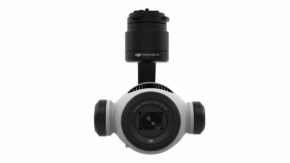 The only question that remains is wether the X5 makes any sense over the “old” Zenmuse X3 that comes with every basic Osmo and DJI Inspire 1. The simple answer to that question: With the autofocus functionality of the X5 the Osmo really makes sense. But on a drone the X5 might not be a huge step after the X3 and you should think twice about the upgrade. We have a comparison between the X3, X5 and X5R coming up later today. After spending a little more time with the Zenmuse X5R on the Osmo and on an Inspire drone, I can confidently say that it produces amazing results that still impress me and the Zenmuse X5 is certainly no match. At the end of the day your budget and workflow possibilities will probably impact your decision here. The X5R has a premium pricetag, especially with the expensive SSD media and a more complicated and storage intense workflow. With all the facts on the table now we’re interested in your verdict and how each of you can see these cameras in your own workflows. Let us know in the comments. I’m using all three mentioned cameras. In my opinion the X5 is a major step up to the X3. The X5 is much better in low light, has less noise, different lense options (12, 15,17,25, 45 and 14-42mm). We’ve done many different jobs for tv stations around the world and everybody was happy. Sure, the gain on the X5r is massive. But the raw workflow is a overkill for most of our clients. We hope we’ll see a new option with something like ProRes 422 and 10bit in the next release which would be really great. Sadly most of our customers who see/want the benefit of raw 444 still think the X5r is just a toy. Most of them shoot the rest of their projects with RED or Arri anyway. So they want a RED or Arri camera also up in the air. I my observation the X5 is not a huge leap. And yes, a proper ProRes 10 bit version would be great. Maybe we’ll see something like that in the far future. I am an x3 owner and pilot and was very excited to see the difference in the x5, but I am a little confused by watching this comparison video. I am seeing a sharper image on the x3 and softer, possibly even out of focus image off the x5 (could be operator fault). I am also noticing (if you put video full screen) some “Jello” action happening with the footage of this x5 in the video. The X3 does not have any “Jello” happening and appears sharper and even smoother. The specs with the increased bit rate and on the x5 doesn’t make this add up and therefor I am confused. Can you help me understand why the x5 looks not that impressive from this comparison? I am in full agreement with you about this video. I saw it a while back and actually thought that they my have mixed up the samples as the x3 looked better to my eye as well. I too would like to see a better comparison between the x3 and x5 as I would like to make the jump. Also if you use some ND, a color chart and do a little grading the x3 can give very nice results. and as Mathias mentioned the clients might not even think that is good enough. Here is a link to a small minute 30 second piece of some x3 stuff I just filmed with the exception of one shot (let’s see if you can guess which;) anyway if any x3/x5 users would like to chime in of if they believe I would see a $2000 difference I would sincerely welcome your thoughts. And thanks a million Sebastian for your continued education. Hi sebastian! I have x5r from last week. I have a question: bitrate of SD CARD H.264 is best of the X5 h.264? Hi Enzo, just confirming what Minu said. The h.264 on the X5R gives you the same image quality as the X5’s. Correction: I just tested all 3 cameras. The X5R proxy clearly is worse than the X5 native h.264 files.